For those of us who have struggled to identify the Algarve’s wonderful wildflowers using only a general Mediterranean wildlife field guide, this dedicated Algarve ‘flora’ has been much anticipated. The wait was well worthwhile. A clear and easy-to-follow introductory section provides essential information about the Algarve landscape and its habitats, followed by guidance on wildflower identification and classification. The main text comprises descriptions of nearly a thousand species, arranged by botanical families and illustrated by 650 in-habitat photographs which many of us find more helpful than drawings or paintings, no matter how competent the artist. A further 780 line diagrams illustrate important structural details. The flowers are listed first by their scientific names and then by common names (where they exist); this will be invaluable to non-English-speaking visitors, who can cross-refer Latin names to their indigenous guides. The book concludes with a basic glossary of botanical terms and indexes of both English names and scientific names. Understandably not every Algarve wildflower is described - several of our orchids are missing, for instance - but the important rare and endemic species are all included. At £35 this book may seem expensive, and as a hardback it may not be ideal as a portable field guide, but in terms of unravelling many mysteries of the Algarve flora I believe it is a brilliant achievement. Invaluable! 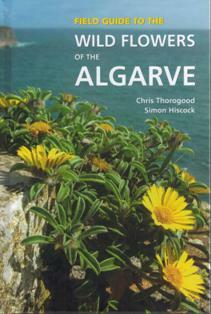 This book includes 100 drawings of wild trees and shrubs found in the Algarve. These include trees and shrubs growing naturally in this area, as well as those that have been introduced here by man and now are regarded as indigenous. Also included are a number of 'look-a-like' plants that do not really belong to the above groups but resemble them by their size or growth habit. Other wildlife and countryside books published by First Nature, including the titles shown below, are available online here... as well as from good bookshops in Britain and Ireland as well as via Amazon, NHBS, Waterstones and other online bookstores. Wild Orchids in The Burren.